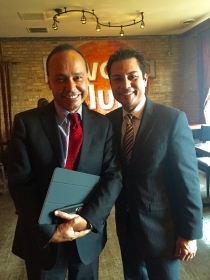 Candidate for Judge of the 6th Judicial Subcircuit Carlos Claudio received an endorsement from Congressman Luis Gutierrez on Monday, Feb. 22nd during a press conference. Claudio began his career as a State’s Attorney where he prosecuted countless DUI cases and quickly rose to become first chair. Eventually, in the State’s Attorney’s Juvenile Abuse and Neglect section, Claudio focused on ensuring the safety and security of children who were endangered by abusive or negligent parents or guardians. Soon after, Claudio opened his own private practice where he took on pro bono work focusing on civil and criminal matters. Claudio is a recipient of Mayor Daley’s Hispanic Leadership Award and a founding board member of Chicago Votes. Claudio was born and raised in the Bucktown/Hermosa neighborhoods and currently lives in Logan Square with his wife, Marina, a family physician in a private on the north, and their 11 year-old daughter Isabella.